Going for a jog is more important to your womanly identity than you might think. Not only does regular physical activity help you feel better about yourself, it also helps your body balance its levels of estrogen -- that mysterious “female hormone” often blamed for everything from PMS to morning sickness. Understanding the effect exercise has on your body’s estrogen levels highlights the need for a well-balanced exercise program for women of all ages. Estrogen is a group of hormones that includes estrone, estradiol and estriol. Your body produces these estrogenic hormones in the ovaries, adrenal glands and fatty tissue. Premenopausal women primarily secrete estrogen in the ovaries, while postmenopausal women secrete estrogen mostly in fatty tissue. During puberty, an increase in estrogen production contributes to the development of secondary sexual characteristics and the onset of your menstrual cycle. Fluctuations in your production of estrogen occur throughout adult life, including during menstrual cycle phases, pregnancy and menopause, and is affected in part by physical activity. Extremely active female athletes often experience a drastic drop in estrogen levels as a result of their intense physical activity and loss of body fat, especially those participating in sports that value thinness, such as ballet, figure skating, gymnastics and running. The resulting dip in estrogen and other female hormones may lead to the prolonged cessation of your menstrual period, a condition commonly referred to as athletic or exercise-induced amenorrhea. Estrogen plays a key role in keeping your bones strong, so long-term athletic amenorrhea could lead to multiple bone problems, including poor bone density and the development of osteoporosis. Treatments for this condition include medication, hormone therapy and limitation of physical activity. Many women combat menopause symptoms by boosting excessively low estrogen levels with hormone replacement therapy, or HRT, which includes synthetic estrogen administered by itself or in combination with progestin. But before opting for HRT -- which may increase your risk of health conditions such as stroke, heart disease and blood clots -- you might want to think about upping your physical activity. Moderate physical activity produces psychological benefits that may reduce or eliminate the need many postmenopausal women have for HRT, according to a study led by Temple University associate professor Deborah Nelson, Ph.D. Published in the January 2008 issue of “Medicine & Science in Sports & Exercise,” results from the eight-year-long study indicate that physically active postmenopausal women experience less stress, anxiety and depression than their nonexercising counterparts. 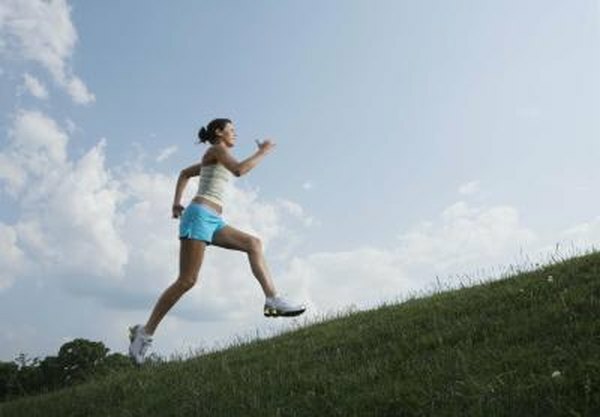 Physical activity did not seem to affect physical menopause symptoms, such as hot flashes. Excessively elevated estrogen levels are linked with an increased chance of breast cancer in postmenopausal women, a risk factor you may be able to combat by increasing your physical activity, says Dr. Anne McTiernan, University of Washington School of Medicine professor. McTiernan led a 12-month study examining the effect of vigorous exercise on blood estrogen levels in overweight, postmenopausal women that had previously led a sedentary lifestyle. Published in the April 2004 issue of “Cancer Research,” the 174-women study revealed that physically active participants experienced a noticeable dip in estrogen levels while inactive participants showed no decrease. Those that lost at least 2-percent body fat showed the greatest estrogen dips.